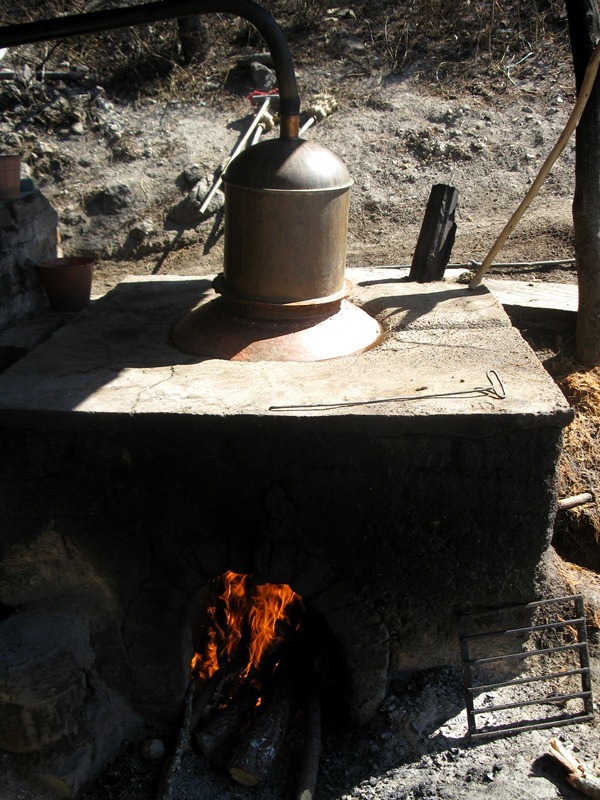 The overall production of mescals and tequilas is really simple and straightforward chemistry. Like for all liquors, a sugary solution is fermented where the sugars are broken down into carbon dioxide and ethanol (alcohol). Then the fermented slurry is distilled a couple of times to purify the alcohol. The largest difference is that for mescal, the agave heart is the source of the sugar as opposed to grapes (wine), sugarcane (rum), or grains (beer, whisky, vodka). Yes, grains contain sugar. The starches are composed of smaller sugar molecules. Now I should explain why agaves have sugar. If you are familiar with any agave plant, you will have noticed that each rosette of leaves will eventually send up a relatively large flower spike (think enormous asparagus spike sometimes 30 feet tall!). In order for the plant to have enough energy to produce this fast growing structure it will start gathering large quantities of starch in the core of the plant. When the plant starts sending up the spike it can be cut off and the plant will continue to be stockpiling as much energy as it can. After a while of this, the leaves are then all cut off leaving what looks like a gigantic pineapple—which is why it is often called a piña (pineapple in Spanish). piñas on the left side. 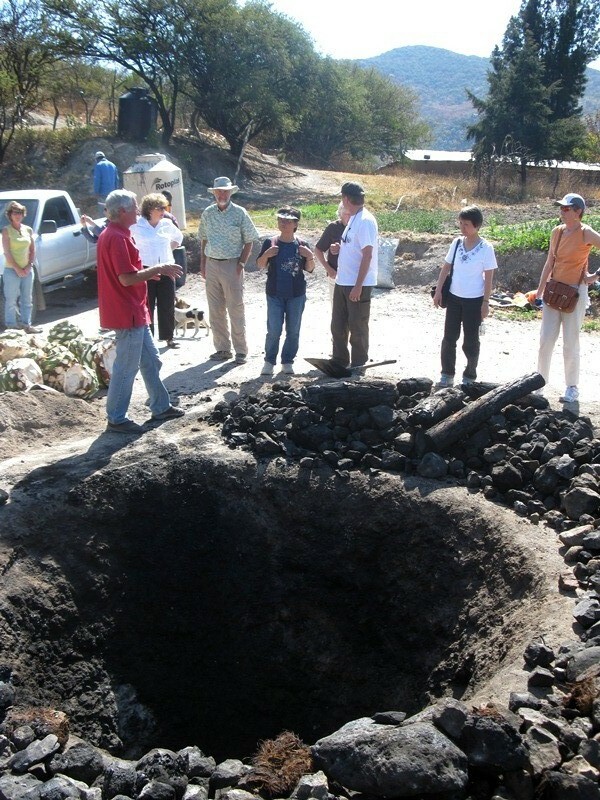 After all of the piñas are gathered from the fields, they are then roasted in a large, covered pit. The roasting will usually last for several days. It is at this point that the carbohydrates/starches are beginning to be broken down into the more simple sugars that the yeast will consume later. It is also at this point that the mescals will pick up some of their ‘smoky’ flavor. It is at this stage that the production of tequila diverges from the more traditional methods of production mescal, raicilla, and bacanora. Tequila is steamed or roasted in large stainless steel vats in order to produce the volume required to satisfy the market. Once the roasting is done the piñas can be cut into smaller pieces and chewed much like sugar cane. The sweet juice is refreshing—just don’t forget to spit out the fibers! At this point in the process the pinas are crushed to release some of that sugar water. That is what you now see in the stores as “agave nectar”. 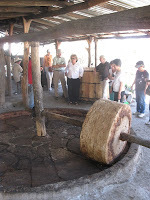 In the traditional way of production you will see a large stone grinding wheel that is pulled around essentially a round, stone-lined (or probably also commonly concrete) basin by a donkey or horse (below left). 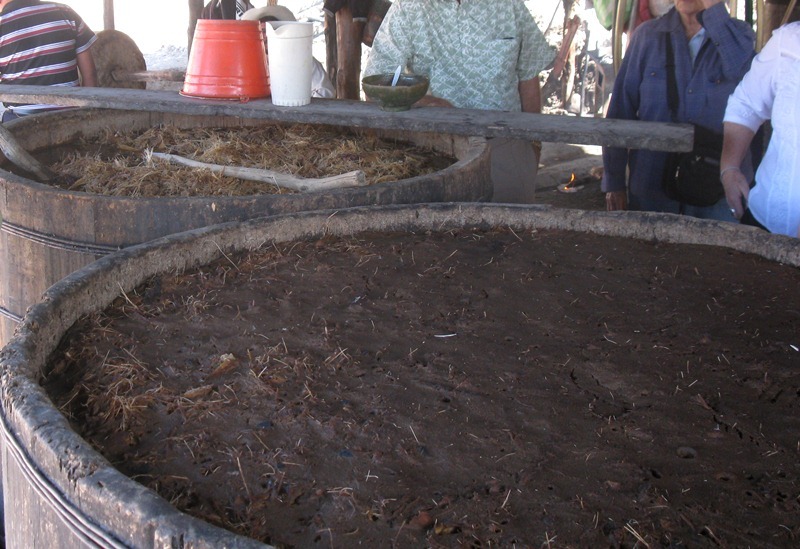 This fiber-filled agave nectar slurry is then transferred into large tubs to begin fermenting. Here is where the yeast does its magic by breaking down the sugars into the carbon dioxide and ethanol (the alcohol we can consume). 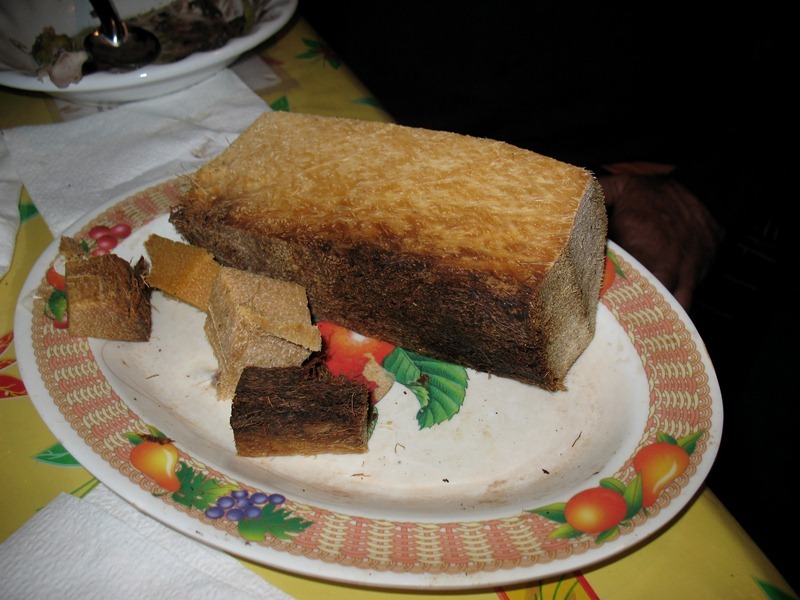 The carbon dioxide byproduct is why our breads rise. After fermentation, the now slightly alcoholic solution is distilled. Since alcohol boils at a lower temperature than water, when the slurry is heated the vapors evaporating out first will have a higher percentage of alcohol. This vapor is then run through long tubes that are submerged in cool water where the alcohol and some water is condensed back into a liquid. This product is then distilled again to continue the purification process. The resulting product is called ‘blanco’, or white. It is a clear solution that is usually considered more ‘rough’ and not as smooth. 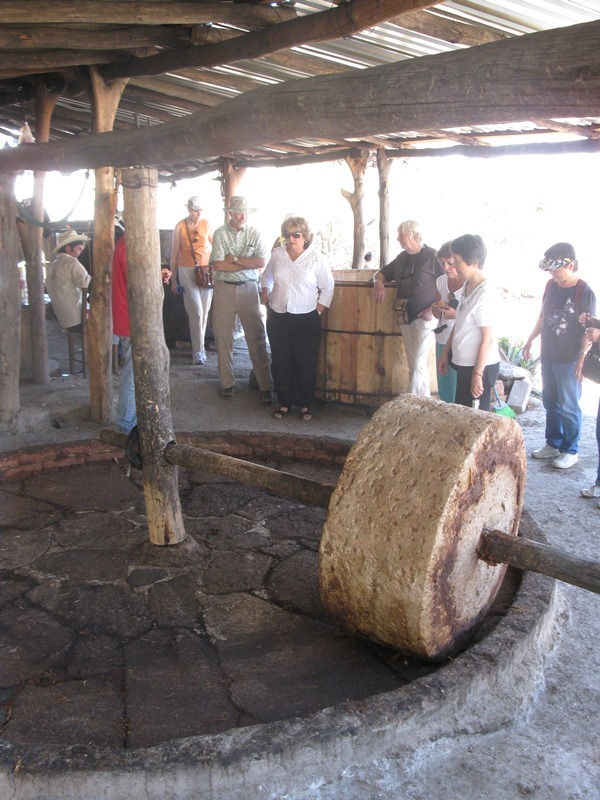 The mescal can then be placed in oak barrels (often reused from wines or whisky/bourbons from the US). 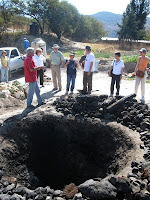 After being aged in these charred barrels for ~12 months they will have a light color and are referred to as ‘reposado’. If left to age longer in the barrels (~18-36 months) they will come out darker and smoother and are called ‘anejo’. The charred surface in the barrels will both continue to purify the product as well as impart more of that smoky flavor. Most of the times raicilla and bacanora are only available as ‘blanco’ whereas many of the mescals and the tequilas will have the three age classes. While tequila is almost always sold at 80 proof (40% alcohol content), you will find some raicilla and mescals that have been distilled to a higher percentage—so be warned! There are also some fantastic (and some not-so-fantastic) flavored liquors that are worth keeping an eye out for. There are herbal, coffee, almond, and many fruit flavors that you will be able to find. My personal favorites are the coffee, almond, and blackberry flavors. I will never touch Kahlua again after tasting several coffee-flavored raicillas and mescals! An interesting side note is that while people are generally used to blanco tequilas not having much flavor, the mescals (in a general sense) are all quite flavorful even when ‘blanco’. This is due to the roasting process in the pit that tequila does not have. The smoky flavor generally increases with age, so anejo is the strongest. Very much like scotches, each producer makes distinct liquor with varying influences on the flavor. So my recommendation is to try many different types. And try them often!